We get sent products pretty frequently and we rarely get a proper chance to cook and test them to make an informed, educated opinion, which is a shame, but we’ve got a long history with chia seeds. Years ago, back before chia was the preserve of the ‘wellness’ set – who we grow more weary and sceptical of by the millisecond – we discovered an Irish company Chia Bia selling chia seeds and experimented with them a number of times. 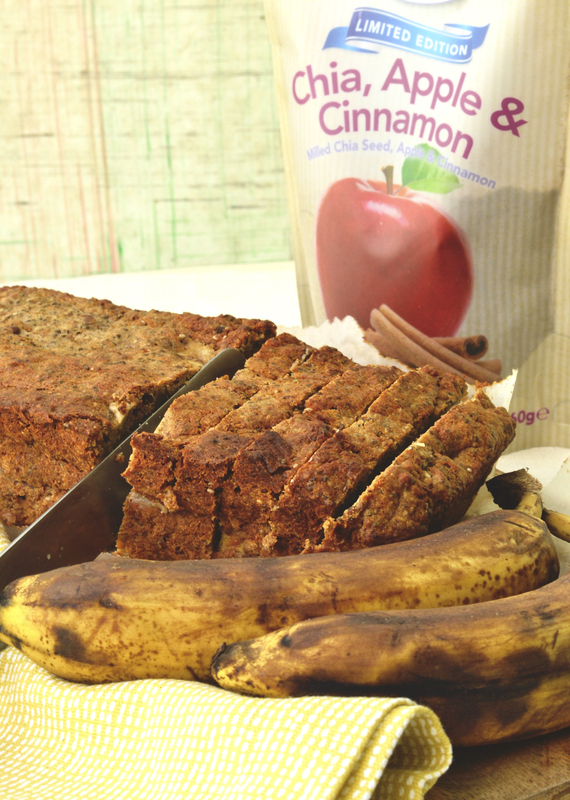 Patrick actually first tried them when he worked at RTÉ Food and we were really excited to see what Chia Bia could do! 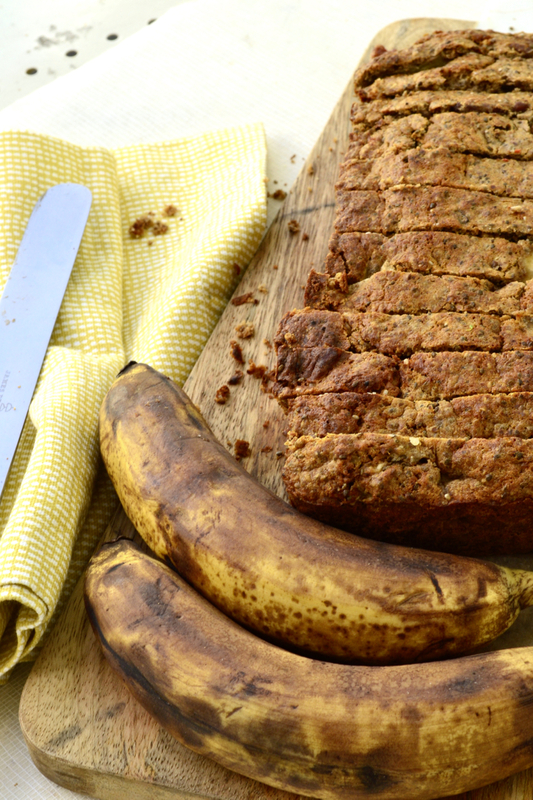 The texture and uses of chia seeds are great, and we think banana bread is one of the best ways to get this supposed superfood into your cookery if you haven’t tried it before. Chia is wonderful as it can replace flour in recipes, take the place of eggs and even instead of butter! Seriously, google it! For those nutritional-minded people, which is not us, chia is also gluten-free, high in fibre and a high source of Omega 3. Chia Bia sent us some recently out of the blue and we’ve been experimenting with them in smoothies, sprinkled on cereal and porridge and we’re still playing around with savoury options too! 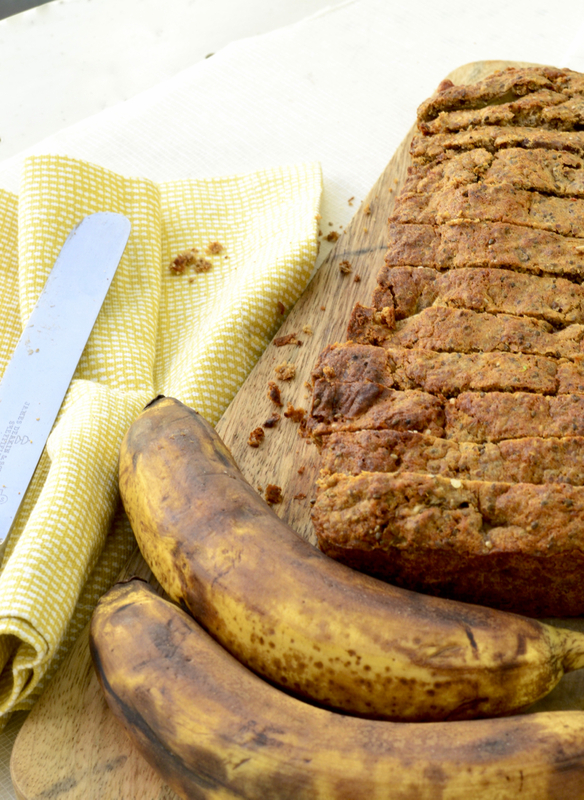 We love to use them dry here, rather than soaked, as they add a gorgeous bitty, seedy texture throughout the soft and sweet banana bread. They virtually have no flavour but lots of benefits to your system, so it’s win-win. 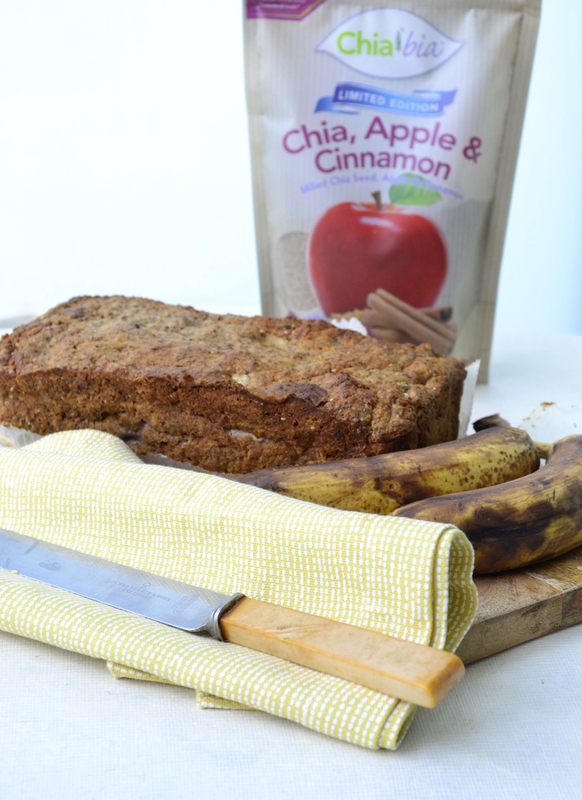 There’s low sugar in this recipe, as it simply doesn’t need all that extra refined sugar, but you can absolutely put it in if you’d like to make this more of a dessert loaf. We’ve made this before loaded with stewed or finely-chopped dates as a complete (and natural) sugar replacement, but more so that we adore the sweet toffee depth of dates. For this recipe, we’ve used small amounts of brown sugar and honey (made local to you if possible, and organic is always better). 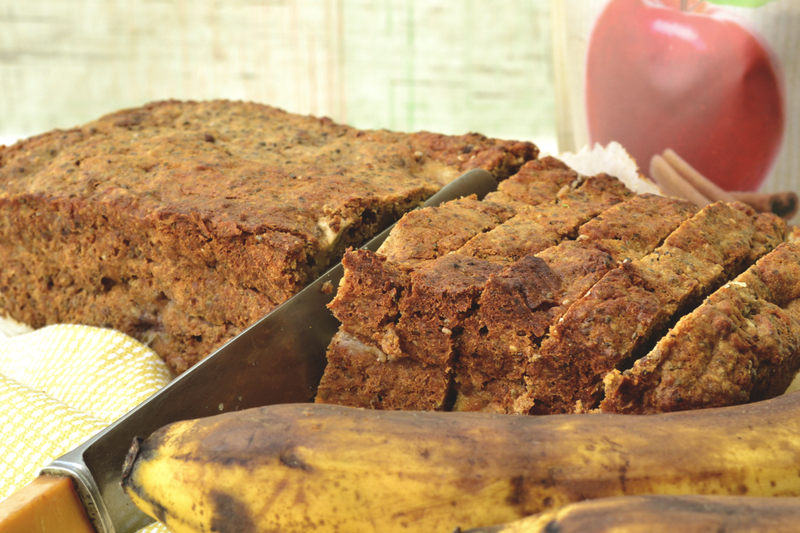 The chunks of banana hiding in each slice bring an unexpected sweetness in each bite – so this is great as a quick breakfast on the go, a snack throughout the day or an after-dinner dessert. We’re munching it pretty much every morning at 10:30am as a breakfast-to-lunch filler, as it goes! Now: there’s quite a couple of specialist ingredients in this recipe as you can see, and which is not normally like us, but we stock our cupboards with as much produce and different ingredients as we can to offer variety in our cookery, so if you have to buy a few ingredients extra hopefully you can have further fun experimenting with them. Or just make this every week for a month… that sounds good to us! 1. In a large bowl, cream the coconut oil with the brown sugar until light, pale and fluffy, then add the honey and mix well. Pre-heat the oven to 170°C and grease and line a standard loaf/pound cake tin. 2. Add the egg mixture a bit at a time to the creamed oil and sugar and make sure it’s all incorporated nicely – if it begins to split just add in a tbsp of flour and it will come together like magic. 3. 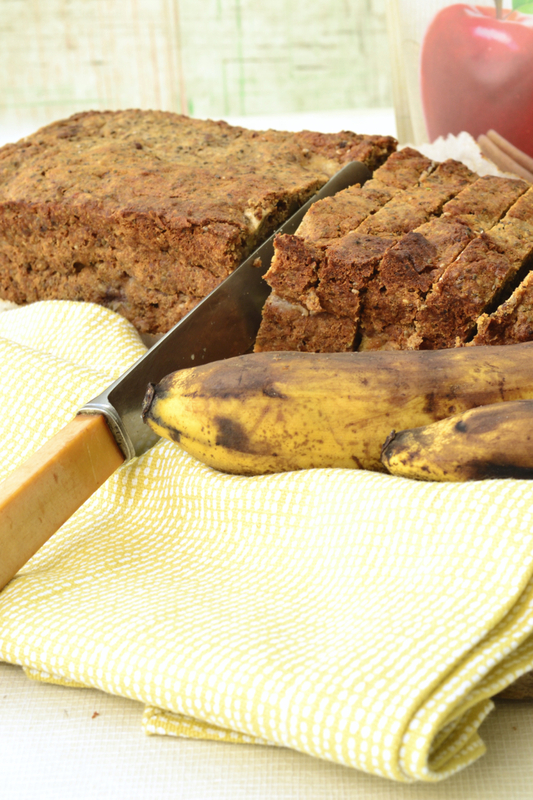 Add the banana – prepared how you like in chunks, slices, cubes, halved etc. – and combine all the dry ingredients and the toasted pecans in a smaller bowl. Stir all to combine and then add to the larger bowl. 4. Now, check for consistency, it will be dry so slacken the mixture quickly with a few tbsp (and any amount up to 100ml) of your choice of liquid. Cooled coffee is a delight here, as is cold tea but milk, water or nut milk of your choice will do fine. Slosh in spiced rum, bourbon or whiskey if you’d like to make this a more decadent dessert. 5. Bake at 170°C in the centre of the oven for 30-35 minutes or until a skewer inserted just about comes out clean. Allow to cool in the tin – a little before slicing and serving hot or completely if you want to eat this cold the next day or throughout the week. Keep wrapped in kitchen paper in a sealed container on the counter and this will keep happily for 2-3 days. Disclaimer: Chia Bia sent us some products to try but this post is not sponsored, paid for, or an advertisement for their products. We don’t work like that and like in every single other recipe we’ve put up, we’ve paid for every other ingredient here. We’ve long used chia seeds, so we wanted to show you how to get them into your diet more, not to try to sell someone else’s product.